Cartagena de Indias, the capital of the Bolívar region of Colombia, is blessed with the perfect location to source an extensive variety of ingredients, from jungle flavors and mountain-grown herbs to Caribbean seafood to all types of pork and beef. The hustle and bustle of the colorful streets of the old-walled city wouldn’t be complete without its many street food stands, which can be found at every corner and in every park and plaza, day or night. The best street food in Cartagena is unique yet traditional, and as a formative component of the character of this lively city, it is not to be missed out on. Arepas are made primarily of Colombian ground maize dough or flour, cooked and compressed into a delicious flatbread that is guaranteed to be served at street food stalls or traditional restaurants at just about any plaza in Cartagena de Indias. 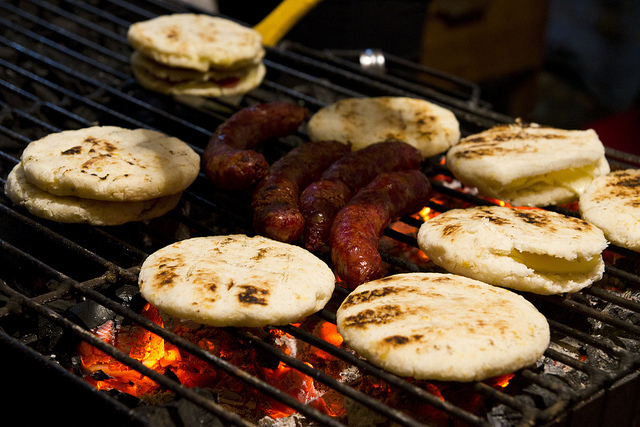 Cheese arepas, being possibly the most popular street food in Colombia, are often served with spicy sauce, guacamole or sour cream. Be weary of buying arepas from street vendors in the very busy market streets of Cartagena, as they may not be cooked with the most healthy oils; for a less greasy arepa, try the food stand that crops up in the late evenings in Plaza San Diego in the walled part of the city. Fresh fruit juices are one of the most common street food stands to be found all around Colombia and in Cartagena de Indias. The Colombian way of making these fresh fruit juices involves crushing the fruit, such as watermelon, which is very commonly sold from stalls in plazas and on the island beaches of Cartagena, and adding water, lime and some sugar. These fruit juice stalls make exotic fruit blends easy to find; from Colombian plum juices to coco limonada, the refreshing Caribbean flavors helps customers bear the tropical heat during the days. Colombian patacones are made with a special twist to this popular Latin American dish. Traditionally made by frying green plantains, in Cartagena de Indias they are fried twice and injected with a heavy dose of garlic, adding a delicious pang of flavor to this dish. Served in restaurants as a popular side dish, patacones are also commonly sold by street vendors amongst a range of other Colombian fritos. To spice up this customary snack, ask for hogao (tomato and onion sauce) or ají (hot salsa) if you dare. Ceviche consists of an array of Caribbean raw and cooked seafood all doused in herbs and spices, like garlic, mayo, tomato and onion, and it’s served in a styrofoam cup. This street food is popular amongst Colombians but not for those with weak stomachs, as you never know where or how the seafood may have found its way to the food stall in plazas like Plaza de la Trinidad. Often with a citrusy kick, that surprises those not well-versed in Colombian street food delicacies, their shrimp cocktail or ceviche mixto is one of the best street foods sold in the lively Cartagena de Indias. Homemade in every household and sold on every street corner, you will find yet another delicious Colombian frito: empanadas are a local favorite and the staple of every Colombian’s childhood. Made from yucca or maize, these fried pastries are stuffed with many types of meat, such as pork, spicy ground beef or chicken, and are a common go-to for a quick lunch from any food stall in Cartagena de Indias. After trying one, you may find you won’t be able to stop yourself from indulging a bit further, as empanadas are a popular Latin American guilty pleasure. These regional treats known as bollos or tamales are made up of boiled hominy, taro or yucca tightly packed into dense buns and wrapped in banana or plantai leaves and packaged with string. A traditional Latin American street food, bollos are a breakfast for champions and are sold by street vendors throughout the day in Cartagena de Indias. Perhaps an acquired taste, bollos are a definite must-try when visiting Colombia if you are a traveler seeking a cultural and culinary experience all in one bite.